This gave me fits for a long time, as there are no viable examples to be found. The gist of the thing is that you want to set up publish/subscribe “queue” in your apps, and on the target machine, for separate threads, or even portions of the same thread, to talk to each other, sending messages. Even though MSMQ is up to version 5 or so now, you can’t find any MS documentation on it. Asynchronous – they will hold onto messages (you can set size limits, or as much as your client’s HDD will hold). Transactions Available – you can easily guarantee delivery of each message, or reduce overhead if the messages aren’t too important. You can also use things like CRCs, ordering, etc. to allow a higher level logic determine if a message should be re-sent. Easy – As you will see below, they are drop dead easy to create. Persistent – Once created on the machine, and not deleted, they will stay-even if your program(s) aren’t running. We will deal with “Private Queues” here, which require nothing fancy. Public ones require domain/AD integration, etc. They work the same. 1. 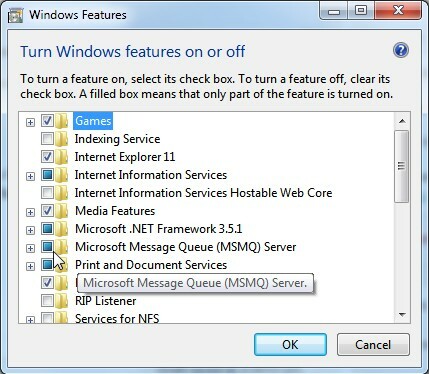 Your PC (development or target) will not have MSMQ enabled by default. You add it in through Add/Remove, or Programs and Features, depending on your OS.
' Send a message to the queue.
' Wait for the message to arrive, and then remove it from the queue.
' Convert the body to a string. …so now any time we call this sub, we know that the program will create (if not exists) a private queue called theq, then use it to send a message. Dim sQname As String = ".\Private$\TheQ"
…was this what you expected to see? Thanks for the write-up! It worked the first time. Previous Post: Dropping a LOT of MS SQL Server tables at once!